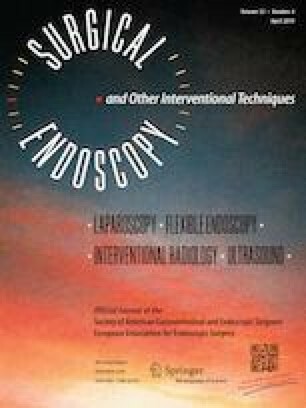 To avoid excessive sacrifice of the tissue surrounding the submucosal tumor in gastric wedge resection with a stapling device, we perform a “combined laparoscopic and endoscopic approach for neoplasia with a nonexposure technique” (CLEAN-NET). Herein the operative technique of CLEAN-NET is described and its short-term outcomes in 50 patients are evaluated. Between December 2015 and July 2017 CLEAN-NET was performed in 50 patients with gastric submucosal tumors. During the operation, the seromuscular layer above the tumor is dissected, while the mucosa is kept unbroken. When seromuscular layer is dissected all around the tumor, the full layer is lifted, and the mucosa is stretched. The mucosa is then transected with a stapling device to execute full-thickness resection of the specimen. Finally, the seromuscular defect is repaired by hand-sewn suture. The hospital records of the 50 patients were reviewed to assess the outcomes. The margin width was compared with those measured in another group with 19 patients, who underwent conventional wedge resection with a stapling device. The operation was completed as CLEAN-NET and the tumor was resected en-bloc without rupture in all patients. The average operation time ranged from 50 to 220 min with an average of 105.4 min. The post-operative course was uneventful. Microscopically the surgical margin was tumor-negative (R0 resection) in all cases. The margin width in the CLEAN-NET group was smaller than that in the wedge resection group (5.4 mm ± 2.5 vs. 33.1 mm ± 14.7). CLEAN-NET can be performed safely with an acceptable operation time. CLEAN-NET can be a useful option in the laparoscopic surgical treatment of gastric submucosal tumors, when excessive sacrifice of the healthy gastric wall surrounding the endophytic tumor should be avoided. The online version of this article ( https://doi.org/10.1007/s00464-019-06765-3) contains supplementary material, which is available to authorized users. Eiji Kanehira, Aya Kamei Kanehira, Kodai Takahashi, Takashi Tanida, Yuichi Obana and Kazunori Sasaki have no conflicts of interest or financial ties to disclose.